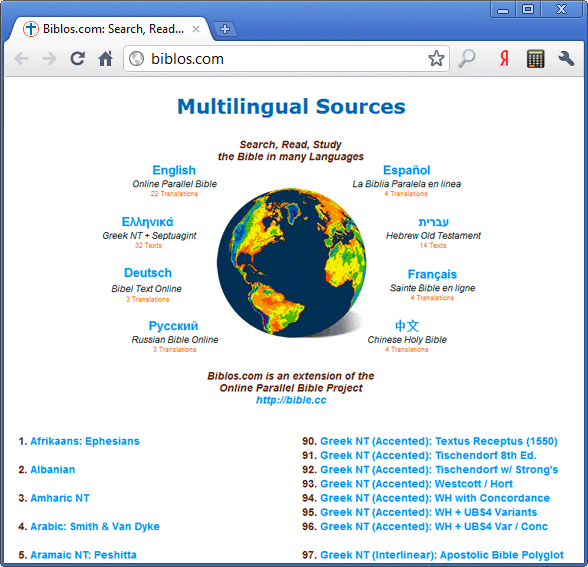 Interlinear translation of the Old and New Testaments and the Synodal translation of the Bible with parallel places and references. There are not many functions. Just text the Bible in Greek with a subscript, click on the words and get the values. The most powerful Bible online. A beautiful, neat site. Usually Internet is laid out simply a database that has earned, and design is not necessary. It's easy to open your translation by clicking the flag of your country. You can see 1 verse in different translations, the interpretation of each word The original language (interpretation in English). If you know English, you have at your disposal a huge library of interpretations. Biblical maps, of fairly good quality, if you do not have enough of this quality, in parallel it is suggested to look at the same place marked on Google Maps. There are page for weight and length measures, also in English. Many beautiful illustrations: drawings and photographs. Interlinear translation of the Old and New Testaments into Russian Vinokurova. The site is made in force, like 20 years ago, but it works correctly. 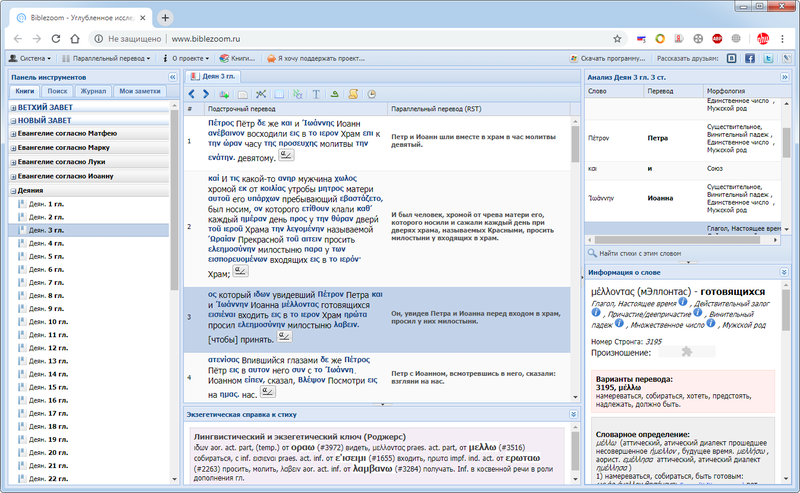 We press the word "Russian" or "Greek" and get a translation or a tampering in a new window. The Old Testament is not translated from the original, but from the Greek translation of the Septuagint and is also made for the offenders. A modern translation of the Torah, which in fact grew into TaNaH translation. Translation tried to do is not religious, but linguistic. The goal was to translate as much as possible to language, time, historically, etc. The main thing on the site is online translation. The text comes with footnotes and interpretations. That now has become the norm. In fact, it is almost impossible to translate a completely different language, to recreate in other language and cultural coordinates a text rooted in a certain language and cultural tradition. Therefore, in difficult places, the interpreter wanted to explain something, because there are footnotes. Just click on the underlined text. The translation also has an audio version. The recording was done by the actors in the roles.